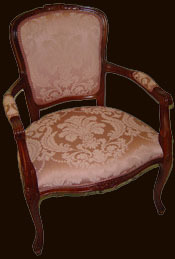 Elegant and well finished chair. larger than a dining chair without taking up too much space - ideal for bedroom, reception room or conservatory. Design your own by choosing your preferred wood colour and material. We can upholster these in your own material. Click Here To View Wood, Finish & Fabric Options.